Professor Mark Stoneking using visuals to explain evolution. The theory of evolution fascinates us till today. 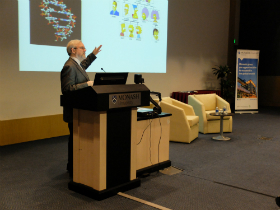 So what better way was there to begin the Sir John Monash public lecture series of 2015 other than a talk by Professor Mark Stoneking himself, one of the world’s leading scientists in the field of human evolution. 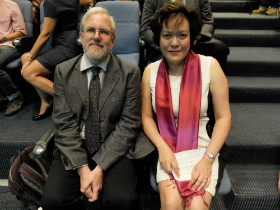 Prof Stoneking’s lecture, titled “Insights from Archaic Genomes into Human Evolution” garnered a packed auditorium. He began his lecture by giving an introduction to deoxyribonucleic (DNA) and how each of us carry a history of our families, going back generations after generations. “All of the variations that we see today, traces back to just one ancestor at some point in the past,” said Prof Stoneking. Over the years, several different models for origins of modern humans have been composed. Prior to two million years, everything about human evolution occurred in Africa. “But somewhere around 250 thousand years ago, something special happened in Africa, and that special something is us. Modern humans arise in Africa and started moving out from there. Modern humans completely replaced without any interbreeding at all the archaic human population. So, according to the Out of Africa replacement hypotheses, we are all Africans,” he added. All the different hypotheses at that time, were based on fossil evidence, and not on genetic evidence. Professor Mark Stoneking and Professor Maude E Phipps. However, the question as to whether archaic humans contributed any genes to modern humans, or is all of our ancestry derived from the recent origin in Africa, can now be answered through genome sequencing. According to Prof Stoneking, mitochondrial deoxyribonucleic acid (mtDNA) genome sequences are able to provide new insights into mtDNA variation and evolution. It is also feasible to obtain mtDNA genome sequences from Neanderthals and other archaic humans, hence providing further insights into human evolution. Early last year, a complete genome sequence obtained from a Neanderthal, indicated there have been several instances of archaic human admixture with modern humans through interbreeding of modern humans with Neanderthals, Denisovans, a recently identified group of archaic humans whose DNA was extracted from a finger bone excavated in Siberia, and or possibly other archaic humans over the course of human history. Findings also suggest that modern humans settled in Asia in more than one migration. Prof Stoneking stated that Southeast Asia was first colonised by modern humans, unrelated to present-day Chinese and Indonesians, and that these and other East Asians arrived in later migrations. These early genetic markers can be seen in the Negrito tribes of Peninsula Malaysia from collaborations with Professor Maude Phipps and team at Monash University Malaysia. To summarise, archaic genomes are a source of new insights,. It is able to tell us of the dispersals of modern humans, genetic changes that distinguish modern humans from archaic humans, and genes of functional importance that we may have received. 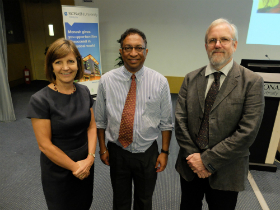 From left: Professor Helen Bartlett, Professor Ishwar Singh Parhar and Professor Mark Stoneking. On whether there are Neanderthals and Denisovans walking among us, Prof Stoneking said that we would be able to distinguish the difference between them and modern humans. So, his answer was ‘No’. The Sir John Monash public lecture series provides Monash University Malaysia an opportunity to engage the community in Malaysia and the region, through the promotion of leadership in key areas that are strategic to the development of this region in the 21st century. The public lecture series covers a wide range of contemporary and multidisciplinary topics presented by high profile thinkers, international leaders, policy makers, corporate leaders and leading scholars, distinguished in their areas of expertise and whose work have made significant impact on the global community.